Peru has announced it will debate a gay unions bill after Argentina became the first country in the region to legalize gay marriage. 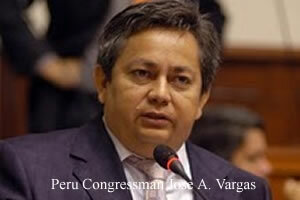 Congressman Jose A. Vargas has told the Peru press that he will introduce a bill that recognizes gay and lesbian couples with civil partnerships. “There are people in Peru who have freely chosen to build a life together … and in a democratic society we have an obligation to protect them because there is a fundamental democratic principle against discrimination,” Vargas, a member of the ruling Alianza Popular Revolucionaria Americana (APRA) Party, said. Gay couples would be required to live together for a minimum of one year. Warning that the bill is a ploy to win voters' affections, the Roman Catholic Church urged against the measure. Consideration of gay unions in Latin American has increased dramatically after Argentina approved its historic law. Two of Argentina's neighbors – Uruguay and Paraguay – are expected to debate gay marriage. And Chile will consider a bill that recognizes gay and lesbian couples with civil unions.